The SMF Research Symposium is an annual conference hosted by the Department of Sexuality, Marriage, and Family Studies (SMF) at St. Jerome’s University in Waterloo, Ontario. The symposium is a one-day conference that highlights student and faculty research dealing generally with relationships, families, and human sexuality. 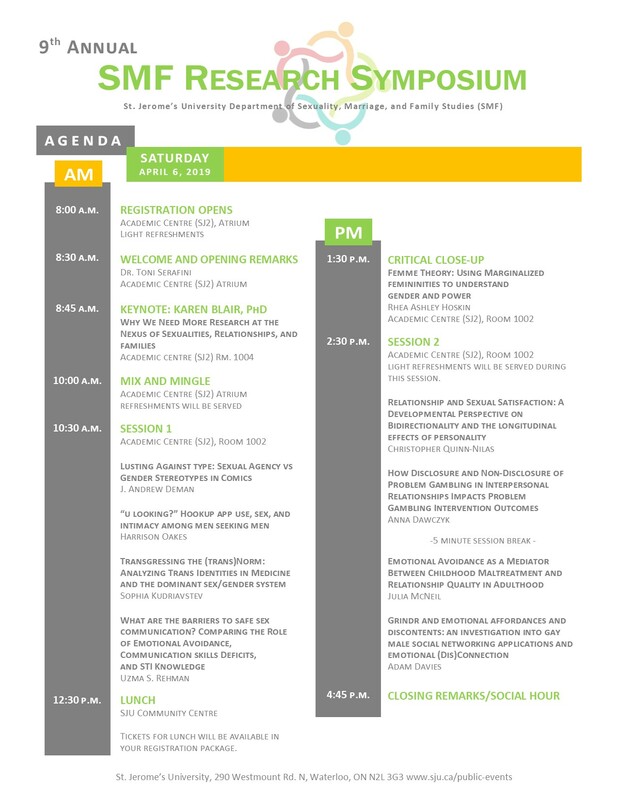 The Research Symposium was first launched by SMF faculty and students in 2009 to bring together an academic community of shared interests in scholarship and research. It is our hope that it will continue to serve as a forum for growth and development within the fields of sexuality, relationships, and families, as well as provide a space for future innovations and professional exploration. The SMF department encourages an overarching vision of social justice and anti-oppression through research and scholarship, and emphasizes the importance of that vision through the Research Symposium. Each year, the SMF Symposium offers an opportunity for students, faculty, and community members to present their research and engage in critical discussions about important issues in the relationships and sexuality fields. These critical discussions often take on a practical or applied focus – how research translates into practice in the human services fields. The Symposium team remains committed to creating a venue where we can explore and discuss theory and research in critical and accessible ways! We hope that you will join us and add your voice to these important discussions. Register Here for the 2019 Conference! Please click here to fast track to our registration page. Please register by Thursday, April 4, 2019.